A couple of weeks ago Jeremy's school did a fund raiser called "Pennies for Patients". 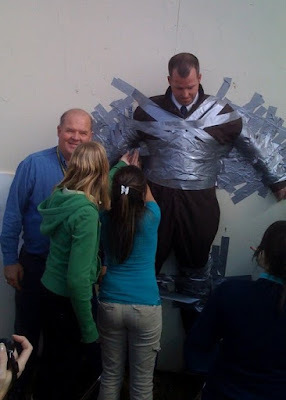 The students could pay a dollar for a strip of duct tape used to tape their principal to the wall! The whole purpose of the duct tape was to see if they could use enough tape to get him to actually hang on the wall. Jeremy stood on 2 chairs for about 30 minutes while all the students came up and strategically placed their tape. The organizers even started to give away the tape after everyone had spent all their money. Finally it was time for the big moment. They removed the chair and Jeremy hung there for about 3 seconds before the tape gave away and he fell to the ground. One of Jeremy's favorite quotes of the day came from a student trying to get kids to buy the tape. He was shouting, "STICK IT TO THE MAN!" Until Jeremy shot him a warning glance and the kid quickly changed his tune, "STICK HIM TO THE WALL!" 3 seconds isn't too bad. So funny. I love my dad's smile too. I think he's enjoying that quite a bit.